The Temple of Apollo Epikourios, one of the most important and most imposing temples of antiquity, stands at an elevation of 1.130 metres in the bare and rocky landscape of Vasses (ancient Bassae which means “little valleys”) in ancient Figaleia, 88 km (54.5 miles) southeast of Katakolon. 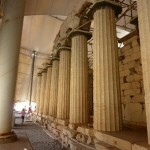 The temple in its current form was built between 420 and 400 BC. 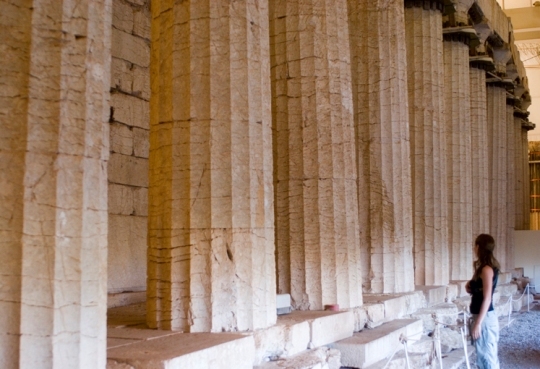 Archaeologists are convinced that under its foundations lies an even more ancient temple, probably from the seventh century BC. 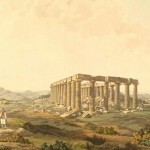 This “new” temple, a unique monument to the skills of its architect, Ictinus, embodies in its structure the entire wealth of architectural knowledge of Greek civilization. With both archaic and innovatory elements, it has been greatly admired by all visiting travellers through the centuries. 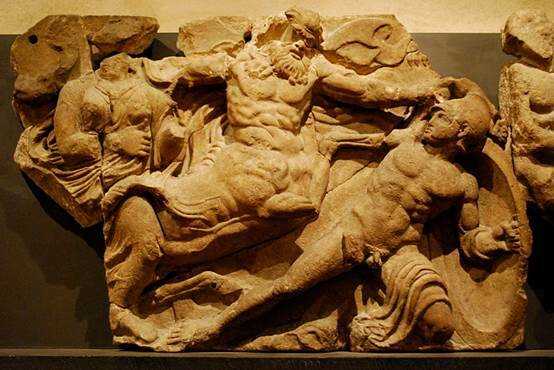 Pausanias, the great traveller and geographer who arrived in Vasses in the 2nd century AD, was stunned by its majesty and strength. 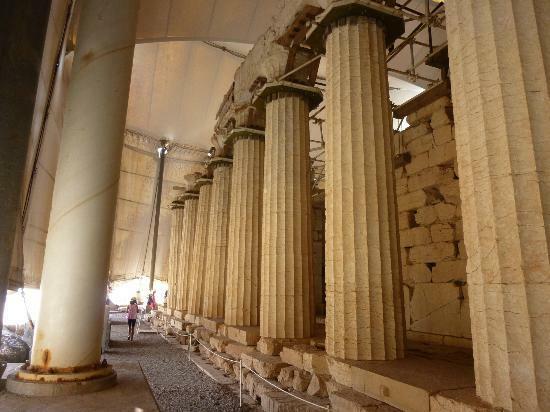 It is speculated that the central column of the temple was designed to reflect the first rays of the summer solstice, symbolizing the eternal light of the sun god, Apollo. If this is true, then this is the first large scale sculptural work of art in the history of mankind to represent an abstract concept. Ictinus made an extensive study of the surrounding area when he undertook the building of the temple. This had the result of making the temple appear as a natural element of its surrounding environment, standing proud and eternal. Light itself is used by the great artist as one of the building blocks of the temple. The play of light and shadow creates the illusion that the temple is smaller than its actual size, revealing its true dimensions to the observer only gradually as they draw near. 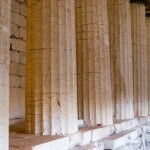 The outer elements of the temple are strictly of Doric order. Inside the temple the sculptural compositions and architectural ornamentation display exquisite artistry and beauty. The capital of the central column of the Temple of Bassae is the most ancient conserved Corinthian capital, and as such the temple may be considered a model for all ‘Corinthian’ monuments of Greek, Roman and subsequent civilizations.The monument temple frieze, of great historical and artistic value, which depicts Hercules, the Centaurs and the Amazons, is today to be found in the British Museum. 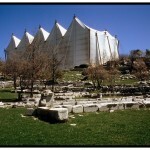 The temple was in use throughout the Hellenistic and Roman periods. 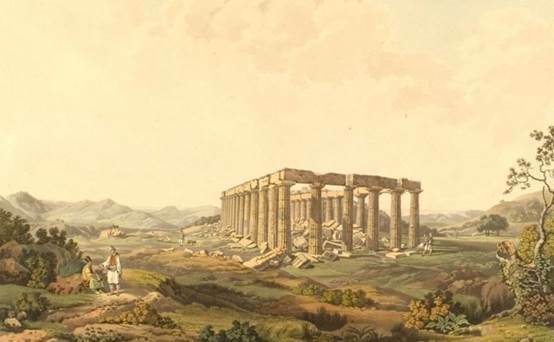 In 1765, guided by the writings of Pausanias, the French architect Joachim Bocher was able to identify certain finds as coming from the great Temple of Apollo. The first systematic excavations were started in 1812 by a group of eminent European archaeologists. 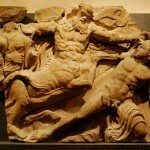 They were continued in 1902 by the Archaeological Society of Athens. Thus, this brilliant achievement of Greek civilization was given back to humanity once again in all its glory. 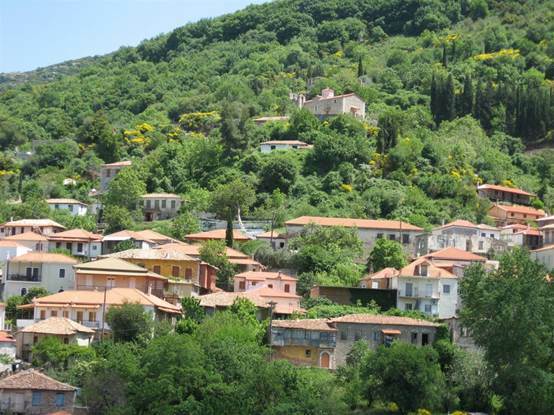 Andritsaina is situated in mountainous southeastern Ilia, on the borders with Arcadia and Messenia. 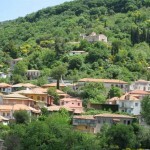 The town is built on a hillside, northwest of mount Lykaion. The river Alfeios forms the northeastern border of the municipal unit. The predominant land uses in the municipal unit are forestry and small scale farming. Andritsaina is 76 km (47 miles) southeast of Katakolon and 53 km (33 miles) from Olympia. 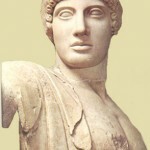 The area was part of ancient Arcadia. 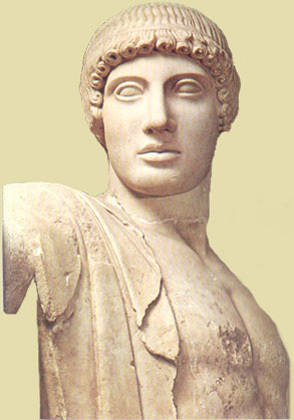 Andritsaina flourished during the occupation by the Franks (13th – 14th AD) and is mentioned in the chronicle of Morea. The village played a crucial role during the Orlov Revolt and the Greek War of Independence. In 1826, Andritsaina was destroyed by Ibrahim Pasha’s troops. Today, the village has impressive old mansions, cobblestone streets, a square surrounded by tall trees and magnificent views. The fountain in the square is the Peloponnese’s oldest fountain, built in 1724. 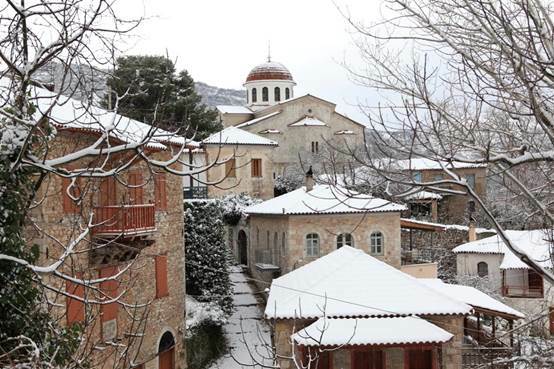 The famous Nikolopouleios library was founded in 1840 from donations of the humanist Agathofron Nikolopoulos, whose family came from Andritsaina. 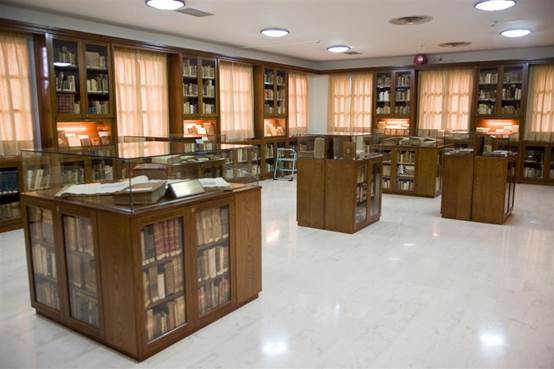 Its collection comprises rare 16th and 17th century manuscripts, in Greek and in foreign languages, important documents from the period of the Greek War of Independence and rich folklore material. 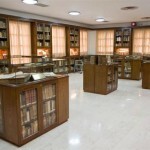 Today, the library has more than 40.000 volumes. 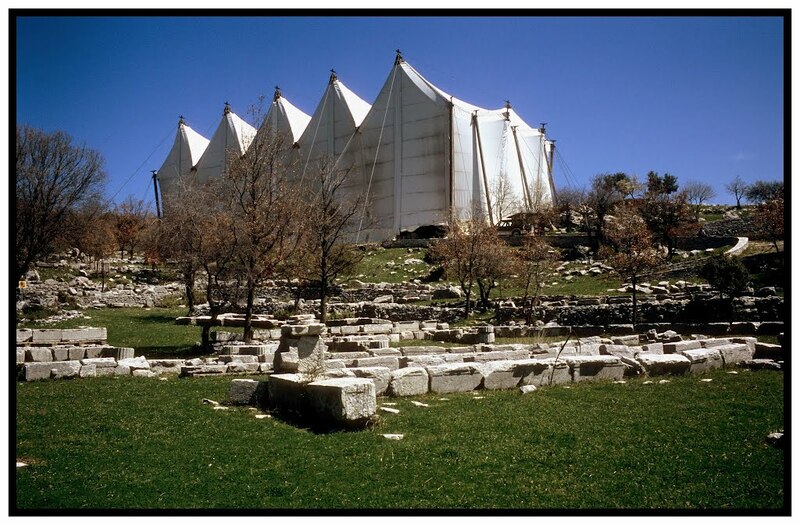 The famous Temple of Appolo Epicurios at Bassae is 14 km (8.5 miles) south of Andritsaina.